On Tuesday April 18, at 7:30 P.M. the Berkshire poet, Charles Giuliano, will give a reading at the Williams Faculty Club (WFC), 968 Main Street, Williamstown, MA 01267. In June, 2014 Giuliano launched his first book Shards of a Life at The Mount in Lenox, Mass. The second, Total Gonzo Poems, was previewed in November, 2015 at WFC. 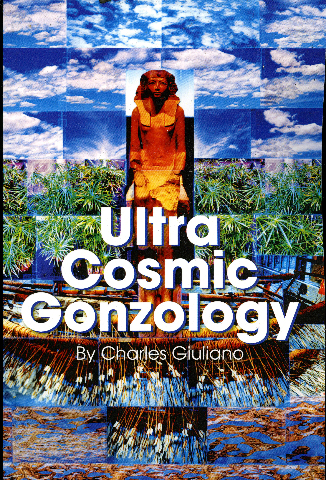 His third, Ultra Cosmic Gonzology, was presented during a residency at the Gloucester Writers Center last August. A fourth book, Gloucester Poems: The Nugents of Rockport, is in production with its release planned for this summer. The upcoming reading will offer selections from the books. In 1970, as a staff critic for the daily Boston Herald Traveler, he was the first to publish the word gonzo which he had recently coined. The now ubiquitous word popped out while he was telling an outrageous story in the living room of his friend the Boston Globe Magazine editor, Bill Cardoso. Gonzo was glommed by Cardoso who famously passed it to Hunter Thompson. Giuliano is the sole survivor of the seminal gonzos. After retiring from a career as a critic and art historian he and Astrid Hiemer, formerly an arts administrator for MIT, moved from Boston and launched Berkshire Fine Arts. The site posts their work as well as that of numerous national contributors. "Off and on over the years I had written poems in my sketch books, "Giuliano recalled. "But it was in the summer of 2013 that I first decided to post 'August' on our site. It was an experiment and initially I planned to publish a cycle of monthly poems for a calendar year. Immediately, there was feedback and that encouraged expanding the project to include other subjects." From the beginning Giuliano largely drew from his own slides and negatives to illustrate the poems. The books are full of vintage family images, collages, and portraits of friends, artists, jazz, rock and blues legends. In a matter of months there was enough material to publish the first book. That entailed finding an editor (Leanne Jewett) a designer (Amanda Hill) and Consigliere /essayist (Robert Henriquez). Astrid was involved in all aspects of the projects from first reader to mentor and editor. "The team has been essential to creation and production of the work" Giuliano said. "The primary challenge has been to develop and sustain the unique gonzo style of poetry. As the work has progressed over four books the style and attack has become ever more intense, outrageous and otherworldly." As Henriquez observes: "It has been interesting to see how the arc has advanced. By the second book Giuliano had harvested the low hanging fruit. As veins of youth, memory and experience were tapped out he dug ever deeper. That meant climbing the tree reaching for the higher and sweeter fruit. Like Icarus there is the risk of flying too close to the sun. That's what gives the work its unique critical edge." As Matthew Titelbaum, the director of the Museum of Fine Arts, Boston put it: "Thank you for Total Gonzo Poems a pleasure to inhale. So much of a time, but also our time- urgent, alive and about the treasure of community." The reading has been produced by John Leavey with support from the Berkshire International Club. The event is free and light refreshments will be served.